The Flower Scarf by Robyn Diliberto. Super cute little neck-cowl. However the flower was an absolute pain to knit. Looks nice when done though. And the Asphodel scarf that I finished a week or two ago. Just hadn't taken any photos til today. Lots of christmas knitting being done at the moment. I found an amazing pattern, or sort of instructions, called 'Textured Shawl' on Ravelry. I used gorgeous wool that I bought in Stockholm. Unfortunately I ran out of wool so I'll have to find something complementary to finish it off. It's a great pattern though and super fast, so I think I'll be making one in future for myself! I started knitting 'Swing' (Rowan pattern) last night for another present. Its really quick, worked on 10mm needles. Just need to sew up and make pompoms now. I checked the long swing bits before starting the hat part to make sure they were the same size. But now they're different lengths. Not sure how I'll fix that. Maybe some serious blocking! A baby with a cold! A pattern from Sublime Yarns - the Mabel Cardigan. A quick knit (love knitting little people clothes) and simple instructions to follow. I just adore the cable around the yoke - it was what made me decide to knit that particular cardie. Made from Smem, but she's not too keen on wearing it yet! The November Giveaway is now open. Up for grabs is a pdf knitting pattern for the Wedding Toppers. This cute pair would look lovely on any knitters cake, and can be customised with colours to match your event. Leave a comment (including contact details). A winner will be chosen at random on Monday 23rd November 2009. Sorry for the lack of posts recently. I feel like I've been really busy, but what have I been doing?? Every day just seemed to pass so quickly. My pattern for this month is finished so this month's giveaway will be on this weekend. Watch for the post! So the pic for this post is from a book I got in Stockholm about making Waldorf dolls. Its all in Swedish so I've a bit of a problem with that, but it's got really good diagrams. I ordered supplies from an online shop in Belgium (shipping from the US is far too high!) so I just need to find the time to make one now. After I've made a start on my christmas presents! Myself and Smem were down in Wexford this weekend for my god-daughter's birthday. We had great fun. Smem wore her new dress to the party. And loved the star-wand she got in her goodie bag when she left! And she had great fun walking along Wexford quay with her grand-parents. Its so cold these days and I feel terrible when Smem is walking around outside with no gloves and no hat on - not my choice, she just won't wear them! I knit these on 3.5mm dpns as Smem is only 1 1/2, not 4 yet. Whether she'll wear them is another thing! This week has been a lot better than last week (Zombie Week!). I've actually managed to get lots of housework done, such as washing, hoovering, building shelving units, etc during the day and, shock, horror! I've also managed to get some sewing done!!!!!!!!! I started this dress last week but it didn't get off to a quick start. I've had the knees go in two different pairs of jeans recently, which is very annoying. One of the pairs I had only bought since Smem was born so I cut the legs off below the knees to use for a dress for her. The top part of the bodice is made from some quilter's cotton from a fat quarter that Smem has had going around with her recently. I figured she liked it so why not make into something she could wear. The inside is lined with dark green cotton, which has a light green ruffle at the bottom. The bottom of the jeans has a ruffle in navy mesh. I think it will make a nice party dress. Just need to sew on buttons now. Eloise finally got her dog and bag. Just in time, it's my god-daughter's birthday on Saturday. Hat and scarf knit with novelty yarn for my god-child for Christmas. This week has been really tough. Sunday night Smem barely slept and she's still not sleeping right. We were nice to her at the start of the week and stayed in the room with her when she was upset but we've had to move to 'controlled crying' as we were both getting too tired. And its too cold to be out of bed for half the night! I think she's making us pay for leaving her! I have managed to get a bit of crafting done, although it hasn't felt like it. There have been two nights this week where I've just watched telly in the evening and not done any knitting - shock, horror! Its my god-daughters birthday next Friday so I'm getting around to finishing her present. I made her Eloise a while ago so I made a little dog (from Jean Greenhowe's Little Village Men) and am now making a little bag for the dog to go in - hopefully with a hole for his head to stick out. 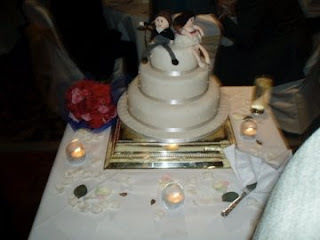 I knitted little wedding toppers for our wedding cake (sorry the pictures aren't great - stolen off Facebook again!). These were knit specific to use - the guy has a little coif of hair - but I may try and make a more neutral pair for a pattern and write that up. They were very funny looking and everyone seemed to like them. One of my favourite exhibitions, and the most memorable, was an exhibition by Livstycket at the Nordiska museum in Stockholm. Livstycket is a non-profit organisation that seeks to integrate immigrants to Sweden into the local life and equip them with the skills to work. The tag-line for the organisation is: 'If you educate women, you educate the world'. How true! At the Nordiska museum the exhibition focused on the textile work that they had done through a series of workshops. The images and colours blew me away. I could have stayed there all day. What follows are a few photos which do not do justice to the majestry of what was created. Check out their website for more info.